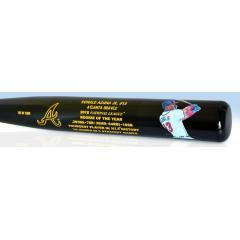 We are proud to announce this special release of a Ronald Acuna Jr National League Rookie of the Year Art Bat! This full-size bat comes engraved with Acuna's record setting rookie season stats and includes original reproduced artwork of Acuna batting by famed sports artist Jolene Jessie. Acuna made his Major League debut on April 25th, 2018 and at only 20 years old, went on to have an incredible rookie campaign. In his 111 games, he hit .293 with 26 home runs, 78 runs, 64 RBI, and 16 stolen bases while leading the Braves to an NL East Division Title. In a hot August stretch, Acuna also became the youngest player in MLB history to ever hit a home run in five consecutive games. The sky is the limit for this ultra-talented player.